Colours can alter the visual appearance of stainless steel wire mesh significantly. 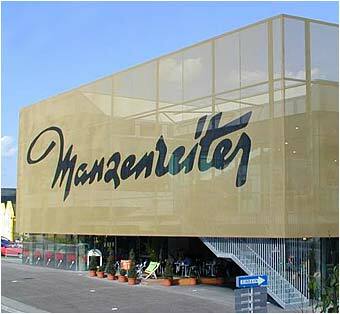 Different methods of coloration are available for signage or decorative purposes. Because corrosion resistance is an intrinsic property of 316 steel, the coating can not be harmed by rust in case of scratched surfaces. Various hues of bronze, gold and copper-like colours can be achieved on the surface of stainless steel by coating the material with Titanium-Nitride (TiN) or Zirconium-Nitride (ZiN). Both have excellent performance properties and a very attractive appearance. Reflectivity of the surface can be varied by adjusting process parameters. Based on an electro-chemical treatment "Poly-Spectral" stainless steel depicts a coloured surface without pigmented coatings. Instead, the wires are covered with a thin, transparent, and chemically resistant layer of Chromium-Oxide. Its impression of colour is determined by the thickness of the layer and the viewing angle of the beholder. Variations in colour are generated by optical interference of light reflected from the surface. Selective coloration - for signage or logos - can bee applied on either on or both sides of a mesh. 7 different colours are available. 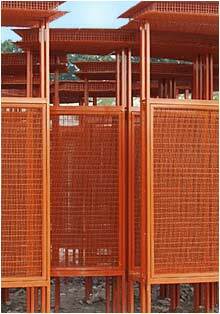 Powder-coating is the most suitable method, to achieve an overall homogenously coloured mesh surface. 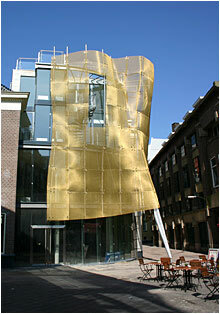 Typical applications are black coated shading and fly screen meshes in front of windows and doors. To adjust the colour of a semitransparent wire mesh façade for architectural needs, powder-based or liquid paints will be applied according to customers' specification.